It may feel like 2017 has lasted for several generations, but we’re actually only about a third of the way through the year. It’s been a horrible year, for the overall world. But let’s ignore that for a second! Things have been pretty good for Broadway, which has had a stronger than usual crop of new plays, musicals, and successful transfers so far in the new year. So, as April showers blah blah blah, here are the best new Broadway shows of the year (so far). Sometimes plays that transfer their off-Broadway production to Broadway run into the problem of basically being the original production, only “biggerer.” Fortunately, “biggerer” is exactly what Lincoln Center Theater’s Oslo needed and deserved. J.T. Rogers’s play about the secret accords that offered momentary hope for peace between Israel and Palestine is massive, both in its theatrical scale and in the complicated geopolitical story it expertly wrangles into drama. But its husband-and-wife protagonists’ political theories are actually striving towards the human, and at the end of this three-hour behemoth, human connection is all that remains of the accords. Groundhog Day just took home two Olivier Awards for its Old Vic production; “Best New Musical,” and “Best Actor in a Musical” for Andy Karl (Rocky), which bodes well for its imminent Broadway opening. The musical itself features music and lyrics from the brilliant Australian musical comedian Tim Minchin (who also composed Matilda), and a book from Groundhog Day’s original screenwriter Danny Rubin. It all comes together in the rare musical that more than justifies its own adaptation from a twenty-year-old movie. Stephen Sondheim once noted that he’d be interested in adapting Groundhog Day into a musical. I can’t believe I’m saying this, but I’m glad he left it alone. In much the same way that Shuffle Along cast new light on a piece of theatre history, Paula Vogel’s Indecent covers the homophobic scandal and obscenity trial that followed Sholem Asch’s 1907 drama God of Vengeance. The story of the play is riveting, with Asch and the play’s team running afoul of both Jewish cultural arbiters who object to the play’s depiction of Jewish pimps and prostitutes, and the police, who shut down the play due to a lesbian subplot. But God of Vengeance seems to gather fresh relevancy every time it is shut down, and Indecent weaves together its various productions with Brechtian ingenuity. A Doll’s House, Part 2 isn’t the kind of play that normally finds its way to Broadway, and no one was expecting it to show up the way it did. Playwright Lucas Hnath is already boasts an impressive resume of hard-hitting off-Broadway plays like The Christians and Red Speedo, but producer Scott Rudin apparently plucked up Part 2 for Hnath’s Broadway debut just on the strength of its script. And Hnath (alongside director Sam Gold and stars Laurie Metcalf and Chris Cooper) has apparently exceeded the lofty ambition of staging a sequel to the original modern drama. Come From Away ’s biggest accomplishment may be that it is a 9/11 musical on Broadway that doesn’t feel emotionally manipulative. That shouldn’t be possible, but it is. Its successful feel-goodery might be in its Canadian DNA, but might also be a side-effect of its stalwart and genuine heart. It also helps that it tells the story of the attacks from an unexpected angle; the Newfoundland town that accommodated thousands of travelers who were forced to land there during the crisis. It has all the timely and heart-warming fixtures of a story about a town banding together to accept and aid strangers, but Come From Away is secretly incredibly smart and includes a subtle warning; this effortless social conscience may not last long. 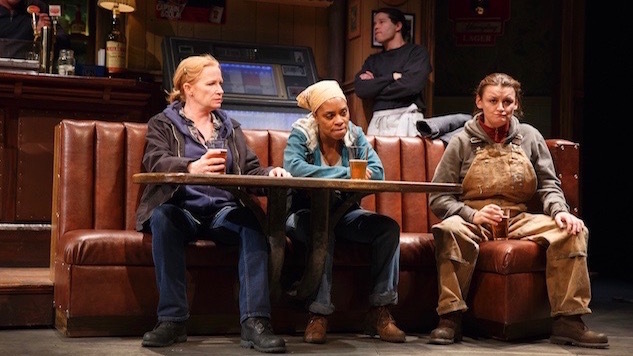 Lynn Nottage recently won the Pulitzer Prize for Drama for this devastating play set in a dying Pennsylvania factory town. Kitchen-sink realism gets a bum rap these days, and a lot of it, I feel, is deserved. But not with Sweat, which packs every atom of Trump-era small town life into the meticulously designed dive bar that serves as its set. If the play was timely at the Public (which opened just before the election), it’s—frustratingly—even more so now that it has made its way to Studio 54.